After some struggling to install the new release of the Pinguino IDE V11, I managed to get it work. Once installed I tried to compile some programs for P8 and works ok, but when I try to compile a basic P32 program it does not function. The compile process fail at some point and I have not a clue what is wrong. Here I attach a capture of the error and the simple program (Basically toggles the USERLED). The target processor is the PIC32MX250F128B. 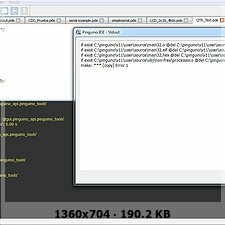 (25-04-2016, 05:52 PM)Leonardo Wrote: After some struggling to install the new release of the Pinguino IDE V11, I managed to get it work. Others have reported the same problem with other compiler targets (P8/P16). One user noted a compare of hex code revealed a two byte difference with the blink test program - I think he said it was the two byte offset for the program start address. I have not heard of a single user having a clean install. There have been enough reported problems that I am not upgrading. Thanks for your response. Indeed, I had to roll back to the previous version Pinguino V11 beta4. I am using Windows 7 x64 and works ok. Sadly, there is something wrong in the new releases (As far I can understand, it seems most of the problems are in the file paths and maybe some bad coded files). But we have to keep supporting this kind of projects. They are free, open, useful and shown decentralized team work. Not always a easy combination to accomplish, I think. I use it in a local high school to develop robotics and other electronics projects with the students, and with great success. Copy and past the following below under the paths section only !! // Pinguino pin D13, port B15, LED1 on the PCB as an output. // Pinguino pin D9, port A10, LED2 on the PCB as an output. Current time: 23-04-2019, 04:09 PM Powered By MyBB, © 2002-2019 MyBB Group.